Porsche Design (Porsche Lizenz- und Handelsgesellschaft mbH & Co. KG), based in Ludwigsburg, Germany, was founded in November 2003 as a majority-owned subsidiary of Porsche AG to combine Porsche AG's and Porsche Design Group's accessories and licensing business into one single company. The company's activities are focused on the Porsche Design Studio (since 2015 Studio F. A. Porsche) in Zell am See, Austria, which works also for other companies in the field of industrial and product design, and the "Porsche Design" and "Porsche Driver's Selection" brands. Following a corporate reorganisation in 2007, Porsche Design Group is now owned by Porsche SE. Originally, there were five independently operated companies with two different brands: "Porsche Design/Design by F.A. Porsche" and "Porsche Selection". The Porsche Design Studio (now Studio F. A. Porsche) was established in Stuttgart, Germany, in 1972 by Prof. Ferdinand Alexander Porsche, (nickname Butzy), Grandson of the Porsche founder Ferdinand Porsche and designer of the Porsche 911. The Porsche 911 (originally 901) is just one example of the many objects Prof. Ferdinand Alexander Porsche designed throughout his career, supposedly off the simple principle that "If you analyze the function of an object its form often becomes obvious." The Design Studio was relocated to Zell am See, Austria, in 1974. Porsche has been producing car-related accessories since the 1950s, with luggage series, purses, T-shirts, calendars, model cars and buttons being offered in the "Porsche Boutique". In the decades that followed, numerous classic accessories such as watches, sunglasses, and writing utensils were created and marketed worldwide. At the same time a large number of industrial products, household appliances, and consumer goods – even streetcars for the city of Vienna – were designed under the "Design by F.A. Porsche" brand. In 1994 the merchandising division of Porsche AG finally acquired the name "Porsche Selection", which was changed to "Porsche Driver's Selection" in 2004. 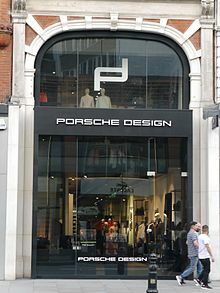 In the year 2012 Porsche Design opened several concept stores all around the world. "Porsche Design Timepieces AG", based in the Swiss Canton "Jura", is responsible for developing and producing Porsche Design timepieces; marketing and sales is overseen by the Porsche Design Group based in Ludwigsburg, Germany. The first watch series offered solely by Porsche Design went on sale in the fourth quarter of 2014. In 2015, the Design Studio changed its name to Studio F. A. Porsche in memory of its founder Ferdinand Alexander Porsche. 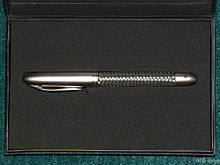 High-end pens and mechanical pencils made from stainless steel. P'500 is the luxury sportwears series. In 2014, Adidas partnered with Porsche Design to launch the Porsche Design Sport by adidas. The P'6510 was the world's first black chronograph released 1972. In July 2015 Porsche Design launched its new timepieces collection, the Chronotimer Series 1. 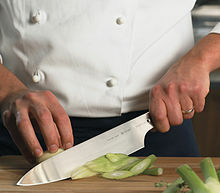 Kitchen knives for CHROMA Cnife. In 1978 Porsche Design presented the spectacles P'8478, one of the most worn sunglasses in the world. The P'8479 was worn by Yoko Ono on various[which?] record covers and magazine covers. Continuous innovations and new materials has produced, for example, the elegant P'8254, totally made in titanium, weighing just 120g (without lenses). In 2016, LaCie, a subsidiary of Seagate Technology announced their partnership on creating luxurious-style computer hard drives with USB-C connectors. In 2011 Porsche Design partnered with BlackBerry to create the BlackBerry Porsche Design P'9981 smart phone featuring a stainless steel and leather design. In 2013 Porsche Design began selling the P'9982 in stainless steel and either crocodile or Italian leather. The device has increased the internal memory of its sister model, the Z10 with a large touch-screen and 64GB memory on board. Together with a 64GB microSD slot the phone can have a total storage of 128GB. In the Fall of 2014 Porsche Design developed the Porsche Design P'9983 phone based on the BlackBerry Q10 with 64GB of on board internal memory. In February 2017 Porsche Design revealed the Book One, a premium 2-in-1 Windows laptop. The laptop is the result of a collaboration between Microsoft, Intel, and Quanta Computer. Unique features of the Book One include a hinge designed to mimic a gearbox, and a detachable screen, very similar to Microsoft's own Surface Book. Porsche Design claims the device is the first and only laptop to be both detachable and convertible. The Porsche Design Huawei Mate Series was a collaboration project of Porsche Design and Huawei since 2016. The Porsche Design Huawei Mate 9, Mate 10, Mate RS, Mate 20 RS and Watch 2 was released. Porsche Design editions of the phones has the Porsche Design logo on the front and the back of the device. The Porsche Design Studio also worked within the transport industry to design projects such as the MX3000 three-car electric multiple units built exclusively for the Oslo Metro by Siemens in Vienna, Austria, being used as modified versions in Vienna (U-Bahn) and Singapore (Airport Metro). Porsche Design is also active in the real estate business designing luxury residences such as the "Porsche Design Tower Miami" featuring three innovative car elevators lifting residents in their cars into so called "Sky Garages" as part of the apartment. Besides Miami, there will be the first Porsche Design Tower in Europe: the "Porsche Design Tower Frankfurt" being finalized in 2018 alongside many other projects in the future to come. ^ Weber, Bruce (2012-04-05). "Ferdinand A. Porsche, 76, Dies; Designed Celebrated 911". The New York Times. ISSN 0362-4331. Retrieved 2018-04-05. ^ "Juergen Gessler, CEO of Porsche Design Group". Luxury Society. Retrieved 2018-04-05. ^ "Porsche Design: Form and Function - The Battle". iF WORLD DESIGN GUIDE. Retrieved 2018-04-05. ^ "PORSCHE DESIGN Presseportal - Home". press.porsche-design.com (in German). Retrieved 2018-04-05. ^ "Porsche Design Sport by adidas Unveils Luxury Sportswear for Fall". Highsnobiety. 2018-04-05. Retrieved 2018-04-05. ^ "Adidas and Porsche Cook Up Some Bouncy Futuristic Sneakers". WIRED. Retrieved 2018-04-05. ^ "LaCie Goes All in With USB-C". PCMAG. Retrieved 2018-04-05. ^ "BlackBerry put a $2,000 smartphone into our pauper's hands". Engadget. Retrieved 2018-04-05. ^ Warren, Tom (2017-02-28). "Porsche Design's Book One is a beautiful alternative to the Surface Book". The Verge. Retrieved 2017-02-28. ^ "Porsche Design's Book One is a sexier Surface Book for $2,500". CNET. Retrieved 2017-02-28. ^ "Huawei's $1500 Porsche Design Mate 9 is a special edition you'll really want". Android Central. 2016-11-03. Retrieved 2018-04-05. ^ "The Porsche Design Huawei Mate 10 is a comical cash grab". Android Authority. 2017-10-17. Retrieved 2018-04-05. ^ "Huawei's Porsche flagship phone has 512GB of storage and an in-screen fingerprint reader". The Verge. Retrieved 2018-04-05. ^ "Huawei's Watch 2 costs $550 more with a Porsche Design logo". Engadget. Retrieved 2018-04-05. ^ innovart.us. "Porsche Design Tower Miami". pdtower.com. Retrieved 2018-04-05. ^ Caposele, John (2017-09-28). "This luxe Miami high rise comes with a car elevator so you can drive right into your living room". CNBC. Retrieved 2018-04-05. ^ "Porsche Design Tower Frankfurt | Germany". www.porsche-design-tower-frankfurt.com (in German). Retrieved 2018-04-05. ^ "Architects Vying for Porsche Design Tower Frankfurt -". World-Architects (in Italian). Retrieved 2018-04-05. Wikimedia Commons has media related to Porsche Design.